In China, we have a proverb that says when a thing reaches its extreme, it reverses its course. This applies to China’s pig industry. China’s fifth pork cycle – referring to the cyclical fluctuation of pork supply and prices – started in April 2015. From there, both the domestic live-pig and piglet prices reached their peak levels in May 2016, to ¥20.70 per kilogram and ¥47.30 per kilogram respectively. Since then, the prices have continued to drop towards the current historic low, decreasing sharply to ¥10.10 per kilogram for the live-pig price and ¥19.30 per kilogram for the piglet price in May 2018. From its peak to the current bottom level, the domestic live-pig price fell by 51.2 percent while the decrease rate for the domestic piglet price reached 59.2 percent during the same period. Firstly, as forecasted in our quarterly pork report Q1 2018, despite some small pig farms having been demolished due to China’s environmental policies, large public pig-breeding companies have been expanding their production capacity and they started to sell their restocked pigs in early 2018. As a result, the total slaughtering volume of fixed hog slaughterhouses in China reached 80.7 million head in the period from January to April 2018, an increase of 14 percent compared to the same period in 2016 and of 18.6 percent compared to the same period in 2017. Secondly, after the Spring Festival holidays, some domestic pig slaughterhouses took the opportunity to undercut prices in a sluggish market. Meanwhile, in a departure from the situation over the past few years, the average weight of live pigs for sale increased from the standard weight of 110-115kg to 125kg during this period. The overweighted and overstocked pigs further intensified panic sales when the domestic pork price plunged. When we say China’s pork market is receding, it does not mean all key players in the pork supply chain are suffering losses. Taking domestic hog slaughterhouses as an example, their hog-breeding margin kept growing in Q1 2018, from ¥197 per pig in January to ¥263 per pig in March. It declined slightly during April and May but still stayed at a high level between ¥190 and ¥220 per pig. As mentioned above, despite a weak consumer demand for pork, the total slaughtering volume of fixed hog slaughterhouses in China increased by 18.6 percent in the first four months of 2018. This indicates that the hog slaughterhouses replenished their stock of frozen pork at a relatively low price during March and April. As those hog slaughterhouses usually follow a strategy of buying low and selling high, the further decreased pork price in early and mid-May could cause a cash-flow crisis. Presumably, their coping strategy has been to push up the pork price and then take the opportunity to de-stock. The short rally since late May verifies this point. In diametric contradiction to the hog-slaughtering margin, the domestic hog-breeding margin took a nose dive in the first five months of 2018. The margin fell from ¥235 per pig in January to -¥263 per pig in May. It decreased by 348.1 percent by the end of May on a year-on-year basis and reached a historic low for the previous ten years. The steep fall in pork prices and increased feed cost jointly resulted in the reduced hog-breeding margin in this period. While many small and medium-sized pig-breeding farms are being forced to withdraw from the market due to China’s new environmental policies, large-scale enterprises are accelerating to expand their production capacity and are contending for more market resources and shares. This increased capacity began to be felt across the industry from early 2018. As shown in the above table, the total sales volumes of major Chinese pig-breeding companies rose greatly against the recessed market over the first five months of 2018. Jiangxi Zhengbang achieved the highest year-on-year growth rate of 166.8 percent while Muyuan Foods recorded the largest increment of 1.76 million pigs compared to the same period last year. However, negatively influenced by domestic plunging pork prices, the companies’ sales revenues are less satisfying than their volumes, some of which even decreased on a year-on-year basis. Despite the gloomy market situation, many key public pig-breeding enterprises have stated that they would stick with their original production and sales plans for the whole of 2018. For example, Guangdong Wens estimates that its total sales volume could reach 22 million pigs in 2018, which would amount to 3 million more pigs than it sold in 2017. Other major players in this industry, such as Muyuan Foods and Jiangxi Zhengbang, have also announced that they hope to continue to expand their production capacity, and their sales volumes are expected to reach 11-13 million and 5.5-6.5 million live pigs respectively this year. As China’s fifth pork cycle develops, it seems clear that both the domestic pork price and import volumes of pigmeat and offal reached their peak levels in 2016. 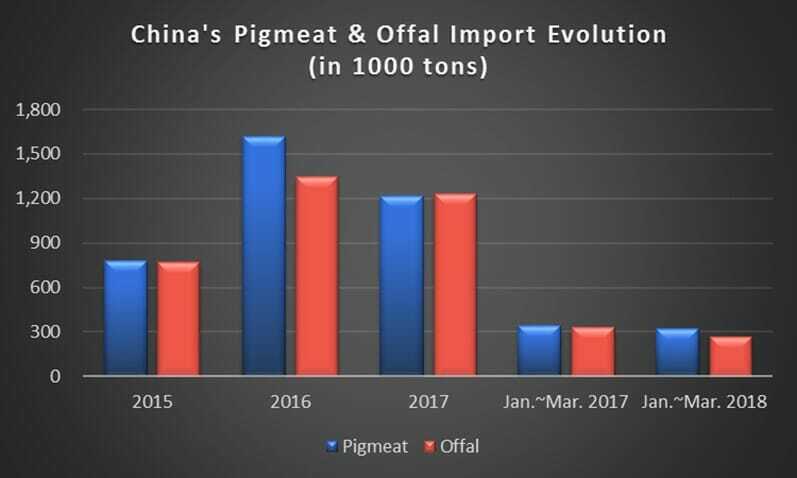 Compared to 2015, the import volumes of pigmeat and offal increased in 2016 by 108.2 percent and 74 percent respectively. Accompanied by a decrease in domestic pork production from 54.87 million tons in 2015 to 52.99 million tons in 2016, the percentage of total imported pigmeat and offal in China’s pork market also rose from 2.8 percent in 2015 to 5.6 percent in 2016. Given that the increase in pork imports was mainly driven by the price gap between the domestic and overseas markets, it is no surprise that China’s pork import volume declined accordingly when the domestic pork price slumped in 2017 and the first half of 2018. Besides the above-mentioned change in imported pork’s volume and market share, the domestic pork price fluctuation has also caused a shift in bargaining power between overseas pork exporters and domestic wholesalers. In a bull market, the overseas pork exporters exert greater bargaining power as there are more domestic pork buyers and wholesalers; in a bear market, the price gap between domestic and overseas markets is narrowed. In this case, some domestic-pork wholesalers would suspend importing pork while others could bargain keenly with overseas pork exporters, especially for homogeneous pork products from different countries. As is known, China’s pork market was also stagnant in 2014. However, the domestic pork market in 2018 has two remarkably different features: the heavy losses by domestic wholesalers and their wide use of monetary leverage. In 2014, the domestic wholesalers suffered losses in general, but they could still earn profits on some specific pork products; in 2018, the losses are overall and heavier for them. Nevertheless, due to the three targeted reserve requirement ratio (RRR) cuts (reductions in the amounts of currency Chinese banks are required to hold in reserve) made by China’s central bank since January 2018, domestic pork wholesalers are finding it much easier to borrow money from their agents or local banks, using their goods as security. This explains why they have been able to hold out for a longer period in 2018 than in 2014, and are enjoying greater bargaining power. In addition, two wild cards are worth mentioning when considering the future of China’s pork import market: the trade war with the USA and fluctuations of the Chinese yuan versus the US dollar. The latter can be partly attributed to the former, as well as the two nations’ economic performance. On one hand, as the trade war with USA heats up, China has announced that it will impose an additional 25 percent tariff on USA’s pork products, which could directly damage the USA’s trade in pork exports to China. If the tariff remains in place for a long time, other countries could have the opportunity to replace the US and export more homogeneous products to China; on the other hand, the fluctuation range for US dollars against the yuan surpassed 5 percent in the first half of this year. The dollar appreciated to 6.5768 on 26 June 2018, reaching its highest value since January. This rise is likely to exacerbate the difficult climate for US pork exports to China, compounded by China’s current slumping pork price and the additional 25 percent tariff on US pork.